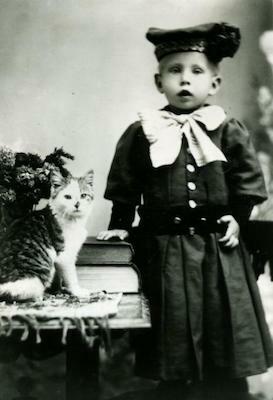 Young boy is dressed with bow tie, dress, belt and hat and stands next to a studio prop. A cat sit on the table, looking toward the camera. This was on the back of a photo of Lars Peter Christensen, and is his son, Leon Peter Christensen. Mother of boy is Kirstine Marie Jensen Christensen.